Cushing’s disease is a disorder in which there is a pituitary tumor causing too much cortisol to be secreted. Cushing’s syndrome is a condition in which there are too many corticosteroids or cortisol present in the blood for one reason or another. Cushing’s disease is a distinct disorder caused by excess levels of cortisol in the body due to the presence of a pituitary tumor. Symptoms include having a round shape to the face and a reddish tinge to the facial skin. The fingers and toes are also usually slender and long, and there is a lot of fat on the abdomen. There is also often a humped appearance because of fat deposits over the shoulder blades. There may be purple lines known as striae present on the abdomen as well. People have muscle tiredness and weakness and tend to gain weight. Often they bruise easily and their skin is thin and is easily wounded. Imaging tests such as an MRI may be used to detect the presence of a tumor in the pituitary gland. A dexamethasone test can also be done in which this chemical is used to decrease cortisol levels. A higher than usual level of cortisol even after being given dexamethasone indicates Cushing’s disease. A corticotropin-releasing hormone (CRH) stimulation test is sometimes done, in which CRH is given artificially and then cortisol levels are measured at varying time intervals. The cause of Cushing’s disease is always a noncancerous tumor that is found in the anterior pituitary gland. This tumor is known as an adenoma and results in too much adrenocorticotropic hormone (ACTH) being secreted which in turn triggers too much cortisol to be produced by the adrenal glands. The treatment of Cushing’s disease is always aimed at the tumor causing the disease. Usually, surgery or radiation therapy is tried to remove or reduce the size of the tumor. Surgery is successful in about 78% of cases. If surgery does not work then the recommended drug for Cushing’s disease is ketoconazole and the recently approved medicine, pasireotide. Cushing’s syndrome is a series of physical problems that are caused when the level of cortisol or other similar corticosteroids in the blood is too high. Patients have a rounded appearance to the face and the face often appears reddish or florid, and fingers and toes are long and thin. Other symptoms include a gain in weight, particularly in the abdominal area, and purple colored lines may also develop and be present on the abdomen. Areas of fat may develop over the shoulder blades on the back. A weakness of muscles and some wasting may also be present. Wounds to the skin do not heal well and there may also be bruises evident. How to diagnose Cushing’s Syndrome? The syndrome can be diagnosed based on physical symptoms and imaging and hormone level tests. Cortisol and corticosteroids can be measured by looking at how much is in the urine, and how much is in the blood serum. The serum test is done at midnight and is more conclusive of the diagnosis, and will show a higher than normal cortisol level at night. A dexamethasone test can be done. What are the Causes of Cushing’s Syndrome? The syndrome can be caused by the anterior pituitary glands secreting too much ACTH, which can be determined partly by measuring levels of this hormone in serum. This is often due to the presence of a pituitary tumor known as an adenoma. It can also be the result of a tumor that is not found in the pituitary gland. For instance, small cell lung cancer can cause ACTH to be produced from tumors outside the pituitary. Besides small cell lung cancer tumors, bronchial tumors can also secrete ACTH. 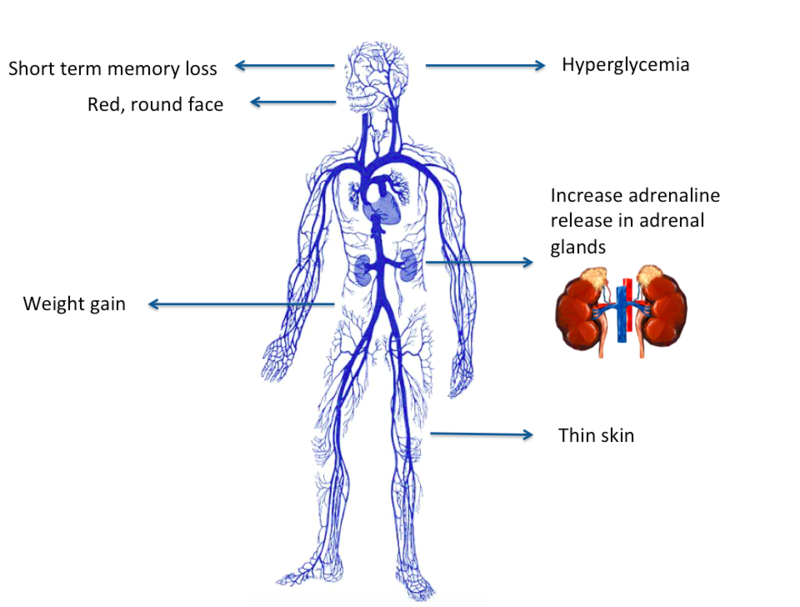 Cushing’s syndrome can also be caused by taking in corticosteroids or from having the rare condition Primary pigmented nodular adrenocortical disease which affects the adrenal gland. The type of treatment will depend on the cause of the condition. For instance, radiation treatment or surgery can help if the cause is a tumor. Dietary changes in which protein is increased can be helpful. In some cases, medications such as metyrapone and ketoconazole may be needed to stop corticosteroids from being secreted. Difference between Cushing’s Disease and Cushing’s Syndrome? Cushing’s disease is a disease where there is an adenoma on the pituitary gland that produces too much ACTH. Cushing’s syndrome is a condition in which there are symptoms indicating high levels of cortisol or corticosteroids in the blood. A pituitary adenoma is always the cause of Cushing’s disease. However, this is only occasionally the cause of Cushing’s syndrome. Cancer is never the cause of Cushing’s disease. Cancer of lungs and bronchial tubes is sometimes the cause of Cushing’s syndrome. Cushing’s disease is never caused by corticosteroid medicine. Cushing’s syndrome is sometimes caused by corticosteroid medicine. The ACTH levels are always elevated in a person with Cushing’s disease. The ACTH levels are not always elevated in a person with Cushing’s syndrome. 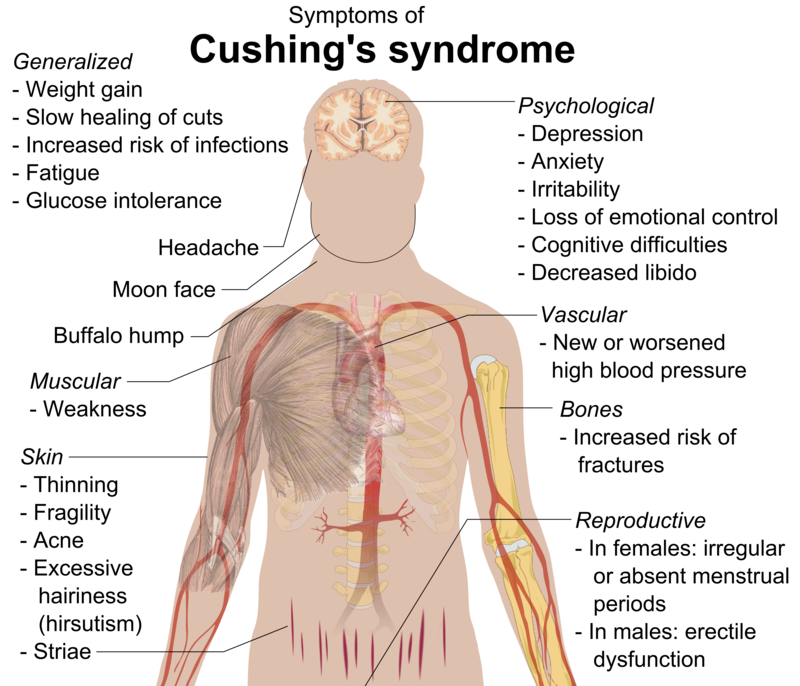 Cushing’s disease tends to occur more often in women than men. Cushing’s syndrome is not always more common in women, and when caused by cancer, is actually more common in men than women. Treatment of Cushing’s disease is always directed at the tumor and usually involves surgery. Treatment of Cushing’s syndrome varies according to the cause of the condition. There is more than one cause of Cushing’s syndrome, including certain types of cancers, and the use of corticosteroids. Treatment of Cushing’s disease is always focused on the pituitary gland tumor. Treatment of Cushing’s syndrome varies according to what the cause of the condition is. Dr. Rae Osborn. "Difference Between Cushing’s Disease and Cushing’s Syndrome." DifferenceBetween.net. January 17, 2019 < http://www.differencebetween.net/science/health/difference-between-cushings-disease-and-cushings-syndrome/ >. Pivonello, Rosario, et al. "The treatment of Cushing's disease." Endocrine reviews 36.4 (2015): 385-486. Ross, Nathan S. "Epidemiology of Cushing’s syndrome and subclinical disease." Endocrinology and metabolism clinics of North America 23.3 (1994): 539-546.